Earn $0.89 in Podium Club credit. Click to Learn More. 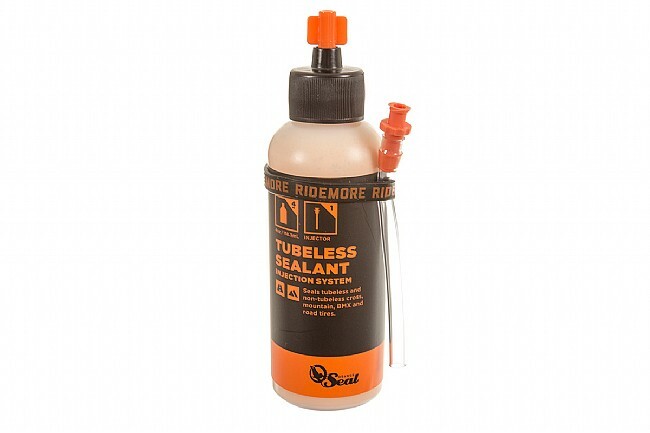 Protect your tubeless wheels from flats with Orange Seal's Tire Sealant. For their tubeless sealant, Orange Seal uses a combination of premium latex and what they have dubbed "nanites". These nanites are solid particles of various sizes that work with the latex to quickly fill holes up to 1/4 inch in size upon getting a puncture. Orange Seal's recipe is formulated to be as light as possible to keep rotational weight to a minumum (4oz adds 119.6 grams to a wheel) and is made from eco-friendly, biodegradable ingredients. Since cycling can take you to many different locals, this sealant is also designed with a long life span and at extreme altitudes and temperatures. Orange Seal's 4oz Sealant with Injector comes with 4oz of sealant and their injection system. I've used Orange for 2 years. find Orange is easy to use, and doesn't clog my stems. I can wash out the cores, and reuse them. Stays liquid, even though I left my bike in its travel box for 8 months. Out of caution, I did dump it out and put fresh Orange in the same tubes. Had a wire flat that I didn't know about until I changed my road tires. Tire held fine, no excessive loss of air. I heard orange seal was good stuff, but didn't have the best experience using it in a humid Texas (near Houston) environment. It may have sealed some pinholes, but I never saw any orange evidence. The real disappointment came in its lack of durability, since it needed refreshing after just 4-5 weeks. If this is a premium product by price, then I would expect much better usage. Put this sealant in my tubular tires, as a an added layer of protection against flats. I always carry a spare tub, but it's a pain to mount it, so I figured I'd give it a try. It works!! Got a small puncture, directly in the center of the tread, on my front tire. Put the hole at the 6 o'clock position, let the sealant coagulate for a second, and I was on my way. That simple. Didn't even have to put air in the tire!! Rode off, and finished my ride!! All I did was add 2 oz. to each tire, through the valve stem, after I mounted the tires. Super simple with the included injector. In my opinion, this works way better than Pit Stop, since I've never had good luck using that sealant. Plus, you don't have to carry the can around in your back pocket! !